The idea had been fairly simple, just your basic hero beats bad guy story. Maybe he’d have to escape after failing in the battle, pull himself together, then face off with Khazar again. Clash, clash, clash and the hero wins. But of course that wasn’t the way I wanted it to go. I wanted it to be different, something more original (well as original as I could be). So instead, what if he simply fails? What if he is defeated and the book becomes more of a fight for survival and to escape the rampaging zombie hordes instead? I’d played Warhammer games as a kid and teenager, loving Heroquest, Bloodbowl, Fantasy Roleplay and Warhammer Quest. One of my favourite characters was the Witch Hunter, a miniature I painted well and looked fantastic. 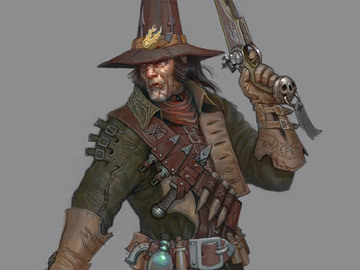 With a cloak swooping out around him, sabre raised and wide brimmed hat I based my protagonist on this character. But instead of the amazing superhero characteristics and powers of your usual fantasy heroes, what if he has to flee in order to survive? This gave him a new dimension, he isn’t the invincible warrior but a survivor.